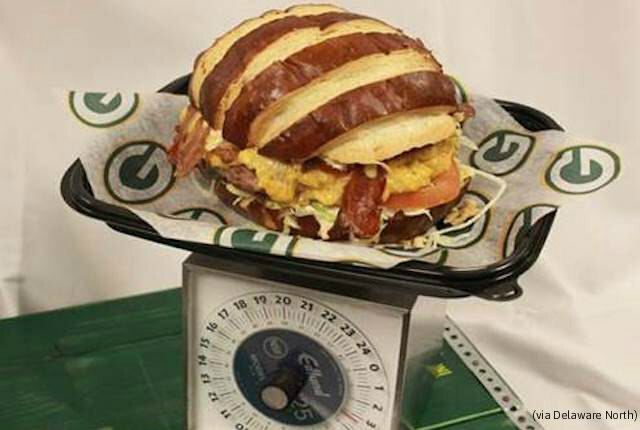 During Sunday’s NFC Divisional playoff game, the Green Bay Packers will attempt to their fans warm by offering the potentially heart-stopping “Big Game Burger,” which tips the scales at impressive 3 1/2 pounds. The burger costs $20 bucks but forget about the price for a moment. What’s the caloric intake of this monster? God bless anyone who eats this because you’re more likely to remember this rather than the actual game. Digestion of this will soon lead to you falling asleep before you can see Aaron Rodgers limp through the fourth quarter after the pain-killing shot on his bad calf wears off.